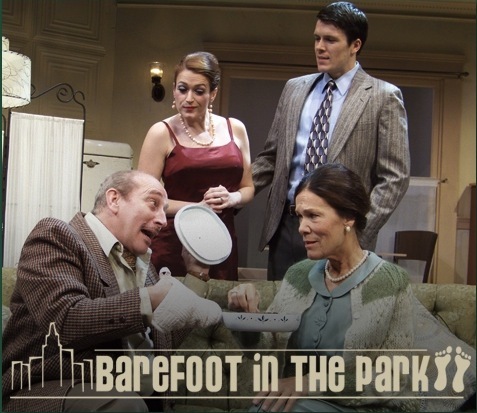 In "Barefoot in the Park" playwright Neil Simon has created one of his most endearing and enduring triumphs. The Majestic is presenting a superb production of this first of Simon's long list of hits. In this presentation everything works. From the moment the lights go up on the unfurnished, fifth floor walk-up on New York's East 48th Street, the laughter begins and, except for a few moments of tension, it never stops. Director Rand Foerster has assembled an amazing cast for this romantic comedy. The plot invites the audience to look in on the first week of a newlywed couple as they settle into their first apartment, immediately following their honeymoon. It is, as Foerster says in his Director's Note, a "flash back in time." Yesterday's audience clearly identified with, and thoroughly enjoyed, that nostalgic view of the past. Darcie Champagne, as the young and impetuous bride, is perfection. From her opening scene, without a single word of dialogue to help her, she establishes her character while eliciting ever bigger laughs from the audience. Matching her, laugh for laugh, is Matt Clark as Paul the husband, also in a Majestic debut. He delivers a hilarious, boisterous, physical performance that is a joy to witness. In what would normally be considered secondary roles, Barbara McEwen as the caring but intrusive mother of the bride, and Bill Nabel as the eccentric, charming and impoverished neighbor, are both absolutely wonderful. Their performances are exquisite examples of creating believable, loveable characters from material that might easily be overplayed by less skillful actors. These two are pros who never miss a beat. Even such brief roles as Roger Patnode's Lord & Taylor Delivery Man and Stuart Gamble's Telephone Repairman become standout gems of humor as presented by these veteran performers. Set designer Shawn Hill deserves special praise for his excellent apartment setting that is transformed from drab to charming between Acts I and II - and the snowstorm is a convincing winner. The Majestic is a comfortable, affordable, and easily accessible theatre producing outstanding diversified entertainment. Missing the current production of "Barefoot in the Park" would be a mistake. It is a complete delight.